We consider mutual weighted boolean formula games (MWBFG), a subclass of WBFG making a natural mutuality assumption on the formulas of players. We present a very simple exact potential for MWBFG. 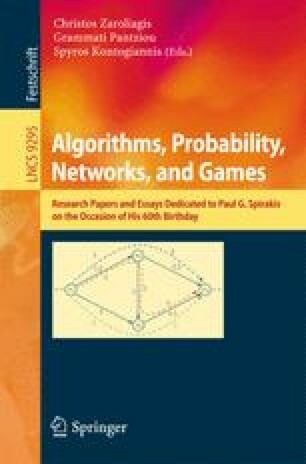 We establish a polynomial monomorphism from certain classes of weighted congestion games to subclasses of WBFG and MWBFG, respectively, indicating their rich structure. We present a collection of complexity results about decision (and search) problems for both pure and payoff-dominant equilibria in WBFG. The precise complexities depend crucially on five parameters: (i) the number of players; (ii) the number of variables per player; (iii) the number of formulas per player; (iv) the weights in the payoff functions (whether identical or not), and (v) the syntax of the formulas. These results imply that, unless the polynomial hierarchy collapses, decision (and search) problems for payoff-dominant equilibria are harder than for pure equilibria. A preliminary version of this work appeared in the Proceedings of the 3rd International Workshop on Internet and Network Economics, X. Deng and F. Chung Graham eds., pp. 467–481, Vol. 4858, Lecture Notes in Computer Science, Springer-Verlag, December 2007. This work has been partially supported by the German Research Foundation (DFG) within the Collaborative Research Centre “On-the-Fly-Computing” (SFB 901) and by the IST Program of the European Union under contract numbers IST-2004-001907 (DELIS) and 15964 (AEOLUS). We would like to thank Paul Spirakis and Karsten Tiemann for many helpful discussions and comments on earlier versions of this work.